Jeryl Kettelson presents the Pioneer Farm Award to Sharon and Jim Karmann. 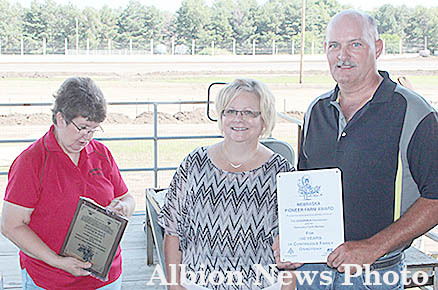 James and Sharon Karmann of rural Albion received the Nebraska Pioneer Farm Award last Sunday morning, July 10, during the Boone County Fair. The award was presented by Jeryl Kettelson, fair board treasurer, at the grandstand after coronation of the 4-H King and Queen. The Karmanns received the award for over 100 years of land ownership by their family. Jim explained that the 161.5 acres of land, located seven miles southwest of Albion, has actually been owned by their family for 101 years. It was purchased by John and Tracy Labenz in 1915. Their son, Merlin, bought the farm in 1979. It was then sold to Wilfred and Monda (Labenz) Karmann in 1986. James and Sharon purchased it from Wilfred in 1994. Jim and Sharon have two children, Chelsea and Ryan. The Karmanns received an engraved plaque and gatepost marker as permanent recognition of this milestone from AKSARBEN Foundation, Nebraska Farm Bureau and the Nebraska Association of Fair Managers.